Another spoonful from the Acid Barn Gravy Kings themselves, Wood Chickens. 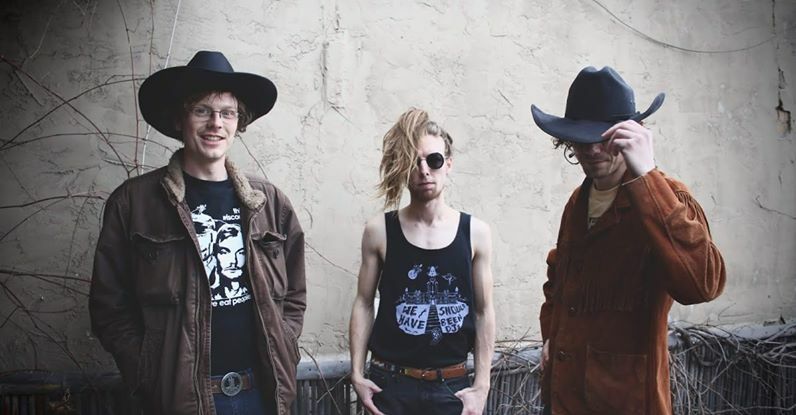 These caffeinated cow punks bring their take on psychedelic country/Western and skate in boots all the way to the bank on this cassette, Wood Chickens Must Die. The three piece from Madison, WI will stop at nothing to defy their country twanged roots. In this 4 minutes and 40 seconds of hayfever tornado riding cassette, you'll hear dust bowl influenced rock n roll clouded with reminiscents of punk, psychedelic and tremelo country. Get it now before it's thrown in the hay-bailer. Wood Chickens are a three-piece that ply you with twisted, country-tinged chunks of punk. This cassette rattles off five tracks in just over four minutes. Lost in a Sea of Sound - "Must Die"
A cassette single or a really compact blast of sound. Wood Chickens from Madison, Wisconsin dial up four micro tracks of half pipe rhythms. These songs combine sonic playfulness with the power of a jet engine at take off. Other than the opening DSL connection to the internet, it would be hard to discern Must Die's temporal origins. Easily interpreted as punk music from the late seventies. Both vocal and instrument power like Fear, and waggish transitions similar to JFA.